When a waterway slices through a city as the Willamette River does Portland, there's bound to be a bunch of bridges. And this being Portland, they're going to be beautiful, functional and one-of-a-kind. Eight bridges span the river downtown, creating the sense that the whole city is holding hands (Kumbaya, anyone?). Among them is the Steel Bridge, a telescoping double-decker vertical lift bridge that is the only one of its type in the world, and the nifty Hawthorne Bridge, the oldest operating lift bridge in the U.S. Portlanders love their bridges  except when they're stuck in their cars waiting helplessly as they rise to let a boat through. You could take a walking tour of Portland's bridges, but a better way to experience them is by bicycle, just as the natives do. 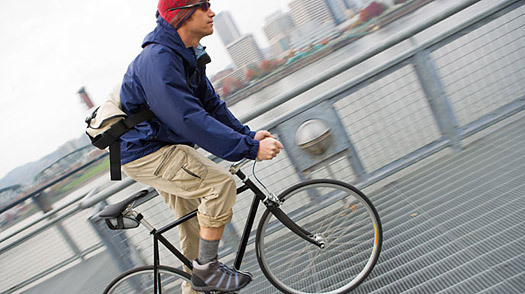 More than 6% of Portland residents commute by bike daily, according to a 2009 Census Bureau survey, and Bicycling Magazine routinely lists the city as a top bike town. Companies such as Pedal Bike Tours and Portland Bicycle Tours will be happy to show you around, but you can just as easily rent bikes from either place and tool around on your own. Portland Guide: Find travel deals, hotels and more!